Moss rocks comes in various sizes from around 50cm - 100cm boulders. 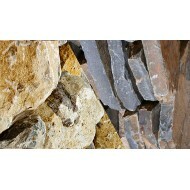 Ideal for rockeries a..
Scoria rocks comes in various sizes from around 50cm - 100cm boulders. Ideal for rockeries.. Ideal pavers for any garden wanting a upmarket organic look be it a patio or part of a pat.. The slate rocks are grey with flashes of browns reds pinks and coppers through them making..